Basically a triangle or triangle pattern consists of 3 types, namely symmetrical triangle pattern, ascending triangle pattern and descending triangle pattern (descending triangle). These patterns are often found in practice. The following is an explanation of each of these patterns along with the trading method. A symmetrical triangle pattern is a formation where the slope of the high levels and the slope line of the low levels meet at a point so that the pattern resembles an equilateral or symmetrical triangle. In this formation it seems that prices move to form lower high levels (lower highs) and higher low levels (higher lows). In this case the buyer and seller hold a consolidation where the buyer buys at a higher price and the seller sells at a lower price. When both slope lines almost meet then the direction of the price movement will immediately breakout or penetrate one of the two slope lines. 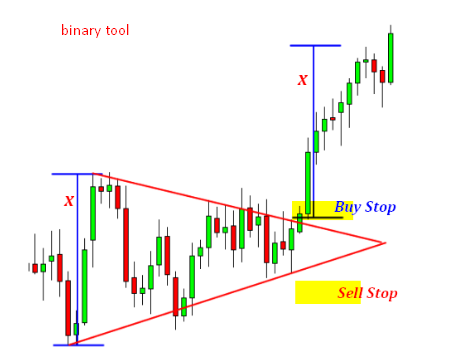 In this pattern we cannot determine a definite breakout direction, but believe a breakout will occur, so we can take advantage by opening buy positions above the high level slope line and sell positions below the low level slope line, namely pending buy stop and sell stop orders. In the example above there is a breakout in the direction of the high level slope line so that our buy stop order is executed. In this case the sell stop order can be canceled immediately, can manually or use the OCO (One Cancels Other) facility. The target level or take profit in pip is determined by the height of the triangle (x). 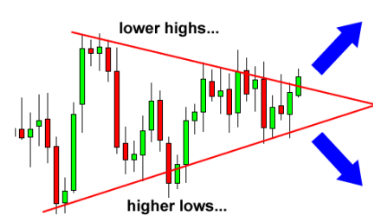 An upward triangle pattern is a triangle formation consisting of a strong resistance level and a slope line from low levels that meet at a point so that the pattern resembles a triangle. In this formation the price appears to form higher lows and move closer to the resistance level. In this situation the seller stays at a certain selling price while the buyer buys at a higher price so that the price gets closer to the selling price. 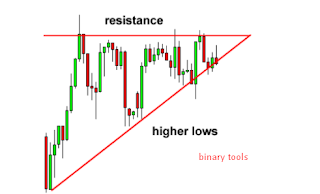 When the buyer's price is almost the same as the seller's selling price, then the direction of the price movement will immediately breakout or penetrate one of the resistance levels or the low-level slope line. In many cases prices can indeed break the resistance level where buying sentiment is indeed stronger than selling sentiment so prices continue to rise and penetrate the seller's maintained level, especially if the situation before the formation of this pattern prices tend to move uptrend. In this case the upward triangle pattern shows a trend continuation. But not infrequently the resistance level is too strong and the buyer cannot penetrate it. This situation can be caused by buying sentiment which decreases or the number of sellers increases so that the price moves through the low slope line and moves bearish. Just like the symmetrical triangle pattern, in this pattern we also cannot determine the direction of the breakout with certainty but believe a breakout will occur, so that it can take advantage by opening buy stop positions above the resistance level and sell stop positions below the low level slope line. 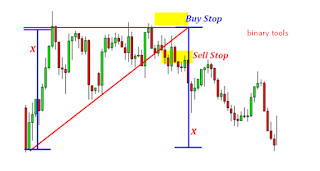 In the example above there is a breakout in the direction of the low level slope line and the sell stop order is executed. Just like before, the target level or take profit in pip is determined by the height of the triangle (x). This pattern is the opposite of the upward triangle. 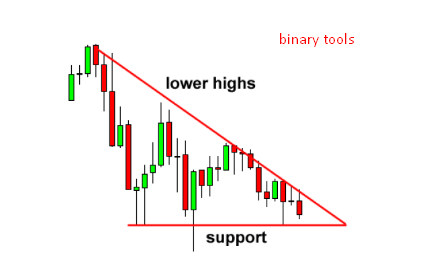 A descending triangle is a triangle formation consisting of a strong support level and a slope line from high levels that meet at a point so that the pattern resembles a triangle. In this formation the price forms lower highs and moves closer to the support level, which indicates a lower selling price while the buying price holds at a certain level. This pattern is the opposite of the upward triangle. A descending triangle is a triangle formation consisting of a strong support level and a slope line from high levels that meet at a point so that the pattern resembles a triangle. In this formation the price forms lower highs and moves closer to the support level, which indicates a lower selling price while the purchase price holds at a certain level. Just like before, we open long positions above the high level slope line and sell stop positions below the support level. 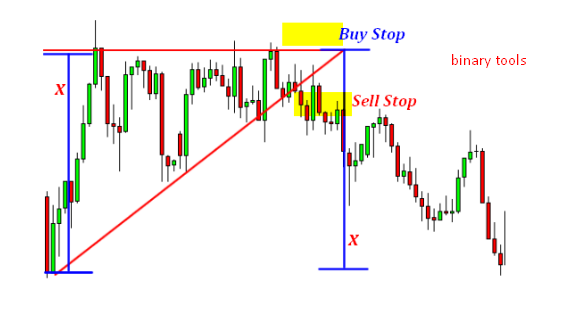 In this example there is a breakout in the direction of the high level slope line so that the buy stop order is executed. Just as before, the take profit level is determined by the height of the triangle (x).